Generating believable and contextual dialogue among non-playercharacters (NPC) remains one of the major challenges in interactive entertainment. Dialogue scenes in virtual environments are crucial to narrative progression and user believability, yet they continue to demand heavy authorial burden. 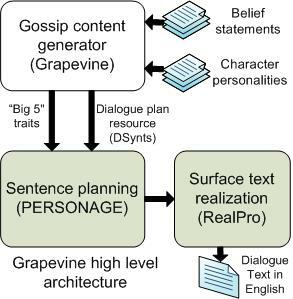 In this paper, we describe our project Grapevine, a system for generating gossipstyle conversation. We model the gossip conversation with a series of speech-acts controlled by a dialogue manager. We model characters with traits derived from the Big Five theory of personality.